I love living in Stockholm and in the summer, when the pace is slower, it's so much easier to respond to the call of art exhibits, film and music. There's so much going on! Here are some of my current inspirations as well as some upcoming free culture festivals that I'm looking forward to. This exhibition at Waldemarsudde presents works by Prince Eugen together with works by a number of his artist-friends such as Richard Bergh, Oscar Björck, Teodor Lundberg and Viggo Johansen, who also painted at Tyresö Palace around the turn-of-the-century 1900. With Lars Lerin, Lars Holm, Anders Wallin, Stanislaw Zoladz and Karl Mårtens. Carl Larsson is one of Sweden’s famous and beloved artists, widely recognised for his paintings of his own family and his home Sundborn. The home in itself a creation made by Carl and his wife Karin Larsson, and that has had an extraordinary impact on interior design world-wide over the last century. But who was he? What did his contemporaries think of him, and how did he see other people and himself? Find out more at Nationalmuseum's exhibition at the Royal Swedish Academy of Fine Arts. While the museum is creating a new exhibition about the history of Egypt, and some of the galleries are closed, you can still visit parts as well as the wonderful shop and restaurant Bagdad Café. 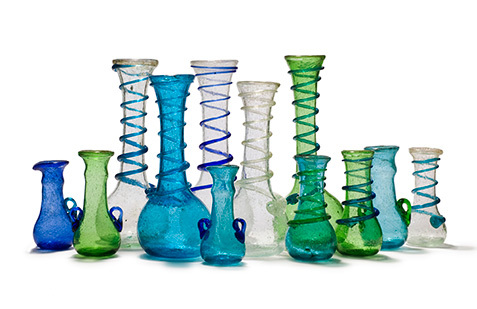 Egyptian vases made of recycled glass. Looking forward to Stockholms Kulturfestival, featuring the world's longest book market and music (including Bollywood Masala Orchestra , a tribute to Velvet Underground and DakhaBrakha (UA), atmospheric minimal ethno-chaos, with Ukrainian, Swedish and Greek folk musicians). Everything happens on the streets and squares is free of charge! Mad Love is the theme for this year's outdoor summer film programme at the Stockholm Filmfestival in Rålambshovsparken. Featuring A Royal Affair, The Kids Are All Right, The Fly, The Beat That My Heart Skipped (De battre mon coeur s'est arrêté), and Eternal Sunshine of the Spotless Mind. Free entry.